Marian Goodman Gallery is pleased to announce an exhibition of new work by Lawrence Weiner which will open to the public on Wednesday, April 3rd. 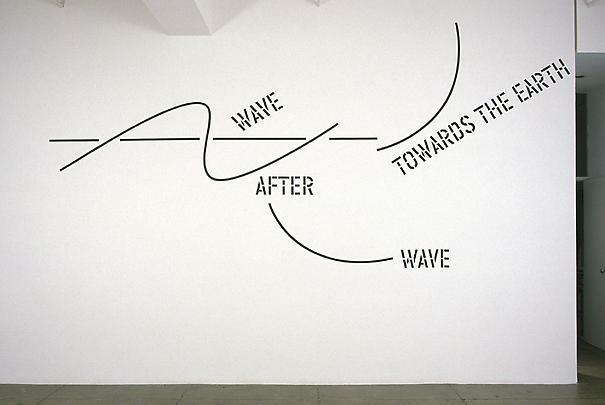 The exhibition, WAVE AFTER WAVE will run from April 3rd through the 27th. Gallery hours are Monday through Saturday, 10 am to 6 pm. On view in the North Gallery will be a sculpture presented in six parts, an installation entitled WAVE AFTER WAVE. In the South Gallery, the artist will exhibit work from two new projects: a film/dvd WILD BLUE YONDER (2001-2002; 15 minutes, 15 seconds), as well as its storyboard drawings. Concurrently, original drawings from a limited edition comic book and dvd, BLUE MOON OVER (2001-2002, edition of 100, comic book and 5 min. dvd) will be exhibited--the 'still' drawings of the book a counterpoint to the animated 'live' drawings of the dvd. In both WAVE AFTER WAVE and BLUE MOON OVER Weiner draws on a favored lexicon: travel, destination, and navigation correlating the relationship to the earth, sea, and sky. 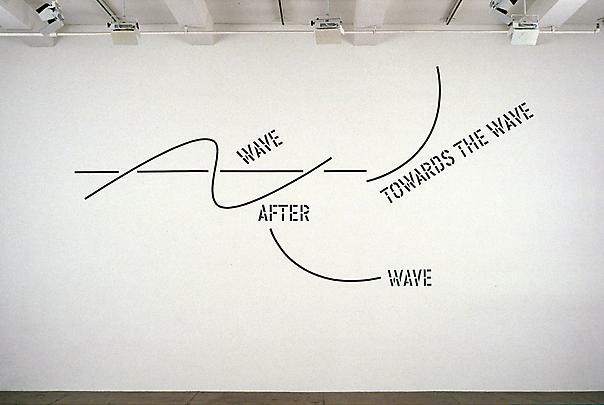 Over more than three decades "language, + the materials referred to", have been the constituent factors in Lawrence Weiner's art practice, and communication about ideas and materials in the physical world have formed the parameters of his work. His work has been best known for its removal of the physical element of sculpture, and for an insistence on common & accessible systems of distribution. Since 1967-68, he has developed a language-based sculpture that not only takes form in installation, but also within a plethora of media such as: artists' books, comics, posters, songs and audio works, as well as urban interventions and art for public spaces. He has used film and video as a means of presentation since 1970. The artist explains, " I realized I was working with the materials that people called 'sculptors' work with. I was working with mass, I was working with all the processes of taking out and putting in….I did not think I was doing anything different from somebody putting fourteen tons of steel out. I said it was possible that I would build it if they wanted, I said it was possible to have someone else build it, and then I finally realized that is was possible just to leave it in language." (from an interview with the artist, in Lawrence Weiner, Phaidon, London, 1998). 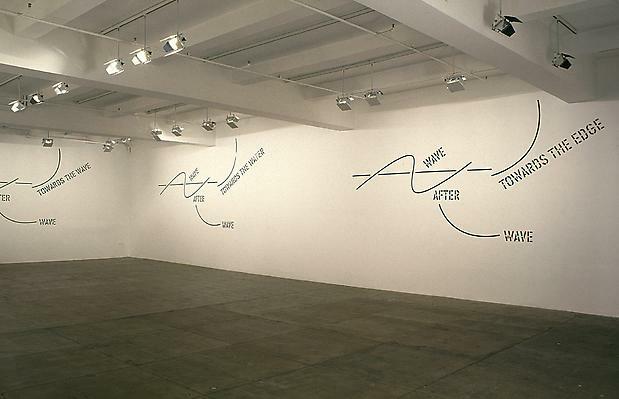 Lawrence Weiner was born in 1942 in the Bronx. He grew up in New York City, and has lived in New York and Amsterdam for most of his career. He has been awarded: the Skowhegan Medal for Painting/Conceptual Art, 1999; the Wolfgang Hahn Prize, Ludwig Museum, 1995; a Guggenheim Fellowship, 1994, and an NEA Fellowship, 1983, among many others. Recent projects include: A BASIC ASSUMPTION, an outdoor work at The Birmingham Museum of Art, Alabama through June, 2002; PER SE/POR SI MISMO, at the Palacio de Cristal y Biblioteca MNCARS, Museo Nacional Centro de Arte Reina Sofia, Madrid (2001); and BENT AND BROKEN SHAFTS OF LIGHT, at the Kunstmuseum Wolfsburg, Germany(2000-2001). Other museum projects include TO BUILD A SQUARE IN THE RHINELAND at the Museum Ludwig, Cologne (1995); and STEEL PENNIES DON'T COME FROM OR GO TO HEAVEN (a work for Dean Clough), The Henry Moore Studio (1993). Important early solo museum survey exhibitions include: the Stedelijk Museum Amsterdam, 1988-89; the ARC, Musee d'art contemporain de la Ville de Paris; WORKS AND RECONSTRUCTIONS at the Kunsthalle Berne, 1983; and his first, the Van Abbemuseum, Eindhoven in 1976. In the U.S.,he has exhibited at the Philadelphia Museum of Art (1995); the Walker Art Center (1994); San Francisco Museum of Modern Art (1992); Dia Center for the Arts (1991); and the Hirshhorn Museum and Sculpture Garden (1990). Important group shows include: Skulptur Projekte Munster, Germany (1997); The Whitney Biennial (1995); Magiciens de la Terre, Centre Pompidou, Paris (1989); and Documenta 7 and 5 (1982 and 1972). In 1995 his books were shown in LEARN TO READ ART: LAWRENCE WEINER/THE BOOKS at the New York Public Library. An ongoing archive of his posters is maintained in the collection of the Vancouver Art Gallery Archive, British Columbia. The film and video work has been shown in retrospectives at Jeu de Paume, Paris (1992); Schule und Museum für Gestaltung, Zurich (1994), the Nova Scotia College of Art & Design, Halifax (1996); and Kunstbunker Forum für Zeitgenössiche Kunst, Nuremburg (1998). Numerous national and international commissions and public projects have included, most recently, a Public Art Fund project in 2000 in collaboration with Con Edison and Roman Stone, for which an edition of Weiner's 19 cast iron manhole covers were "permanently" and strategically placed in New York City.